40mm polished 904L stainless steel case, screw-down back and push buttons, screw-down crown and push buttons with Triplock triple waterproofness, black monobloc ceramic Cerachrom bezel with engraved tachymetric scale, scratch-resistant sapphire crystal, black lacquer dial, 18K white gold applied applique hour markers with Chromalight, grey snailed counters, automatic movement with chronograph central second hand, 30-minute counter at 3 o'clock, and 12-hour counter at 9 o'clock, approximately 72 hours of power reserve, 904L stainless steel Oyster bracelet with solid links, folding Oysterlock buckle with Easylink 5mm comfort extension link. Waterproof to 100 meters. 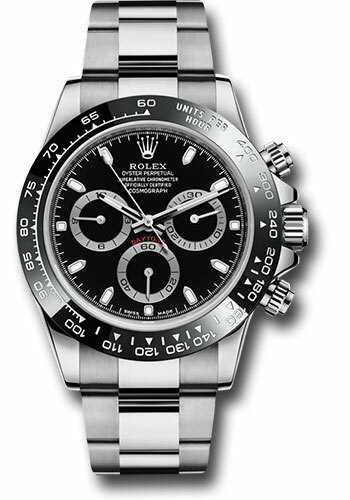 Prices of Rolex Daytona Watches continue to rise due to very limited production levels. Introduced at Baselworld 2016 Website. 40mm polished 904L stainless steel case, screw-down back and push buttons, screw-down crown and push buttons with Triplock triple waterproofness, black monobloc ceramic Cerachrom bezel with engraved tachymetric scale, scratch-resistant sapphire crystal, white "panda" lacquer dial, 18K white gold applied applique hour markers with Chromalight, black snailed counters, automatic movement with chronograph central second hand, 30-minute counter at 3 o'clock, and 12-hour counter at 9 o'clock, approximately 72 hours of power reserve, 904L stainless steel Oyster bracelet with solid links, folding Oysterlock buckle with Easylink 5mm comfort extension link. Waterproof to 100 meters. The 116500 series was first introduced at the 2016 Baselworld Watch Fair.